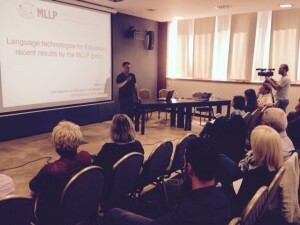 On 18 September, MLLP director Dr. Alfons Juan delivered a keynote speech on language technologies for education at the UNESCO-sponsored Internet of Education Conference 2015 in Sarajevo. The recording of the speech is now available for watching online. The Internet of Education Conference 2015, organized by the Knowledge 4 All Foundation and sponsored by UNESCO, took place on 18 September in Sarajevo, with the goal of bringing together researchers and policy makers from both university and academia to present methods for improving the effectiveness of online and open education. IoE 2015 looked at how education systems and schools in Slovenia and around the world are innovating with Artificial Intelligence methods and tools, STEM projects like MyMachine, video repositories like VideoLectures.Net and innovation environments like OpeningUpSlovenia. The keynote speech by the MLLP’s Alfons Juan focused on the first of these topics, providing an outlook based on the experience of the MLLP in the research and application of innovative educational technologies in large-scale projects such as EMMA, transLectures and Active2Trans. The keynote speech sparked considerable interest among the attendants, which included a strong representation of researchers, education officials and policy makers from the South-East European region. All the IoE 2015 presentations were recorded and are now available for watching online at the Videolectures.net repository. You are invited to watch the keynote speech by MLLP director Alfons Juan, as well as the rest of the IoE 2015 conference. Posted in All, Events, Videos and tagged #ioe2015, #OpeningUpSlovenia, Conferences, Educational Technologies, MLLP video.